If this card is Normal or Special Summoned: You can pay 1000 LP, then target 1 “Vampire” monster in your GY, except “Vampire Scarlet Scourge”; Special Summon it, but it cannot attack this turn. You can only use this effect of “Vampire Scarlet Scourge” once per turn. At the end of the Battle Phase, if this card destroyed any monster(s) by battle: You can Special Summon them from the GYs to your field. Vampire Scarlet Scourge is an instant Link 2 alone upon its summon. Rank 6 capabilities within the archetype, decent attack and fantastic defense, Scarlet Scourge can pay 1000LP to Special Summon a Vampire from the grave upon its summon, except itself. The cost is’nt much, and while that target can’t attack, it can still be used for Special Summons and use its effect(s). Like Fraulein yesterday, a monster destroyed by this card can be Special Summoned at the end of the Battle Phase. If you somehow defeat several monsters during the same Battle Phase, all of them can be Special Summoned. Link Summon capabilities using the monsters it destroys, Rank Summons upon its own summoning for a small cost, Scarlet Scourge is another great piece to add to the Vampire archetype. We continue this week of Vampires with one of the new Level 6 Vampires, Vampire Scarlet Scourge. Scarlet Scourge is a Level 6 DARK Zombie with 2200 ATK and DEF. Solid stats all around for a Level 6, and DARK and Zombie are really good. If Scarlet here is Normal/Special Summoned, you can pay 1000 LP to revive any Vampire monster except another Scarlet Scourge, but it cannot attack and you can use use that effect of Scarlet Scourge once per turn. Any deck having a revival effect is very nice. Scarlet Scourge isn’t hard to get out either in the deck, so this should help you get another monster out to go into a Rank 5/6 or a Link Summon of something like Vampire Sucker. Scarlet Scourge has the same effect as Fraulein yesterday where it can revive any monster it destroyed in battle at the end of the Battle Phase. Scarlet Scourge is a good play enabler for the deck, fueling your Extra Deck plays for a Synchro, XYZ, or Link Summon, all of which Zombie decks commonly do. Play three of this in any Vampire variant. Art: 4.5/5 Again, Vampires have cool artwork. Vampire Scarlet Scourge is a big combo piece to a Vampire Deck, much like yesterday, though while maybe not initially as versatile, still can be an asset to you. Scourge is Level 6 (which actually can hurt, as a lot of the Vampire Monsters are and need to be Level 5) and for the extra Level, you’re only getting an attack increase to 2200 (from 2000) which isn’t worth the extra Level (even if the defense matches). 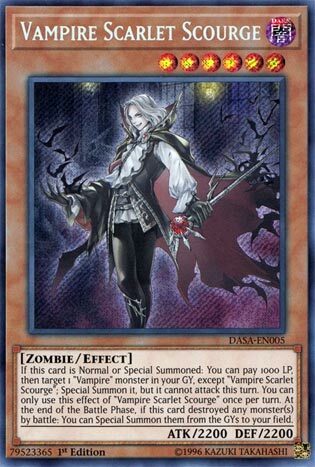 When this card is Normal or Special Summoned (versatility is good) you can pay 1000 Lifepoints to Target and Special Summon a Vampire Monster from your Graveyard, but said Monster can’t attack. You’re likely bringing out a generic Rank 6 XYZ with this ability, (unless you bring out one of the many Level 5 and reduce this Monster to a Level 5 also). But for 1000 Lifepoints, it’s still a useful and welcome effect. Also, like yesterday, any Monster this card destroys can be Special Summoned, in the position of your choice, to your side of the Field. It’s a little slower than yesterday, but it does something different. Big plus you don’t have to be forced into a Normal Summon just for the revival (even with the 1000 Lifepoint cost) cause that would about kill this card.